^ Ankeny, Jason & Johnson, Zac. Wilco > Overview. Allmusic. Retrieved 2012-07-14. ^ Crock, Jason (2007年5月7日). “Interview:Wilco”. Pitchfork Media. 2007年5月9日時点のオリジナルよりアーカイブ。2007年7月23日閲覧。 . ^ Kot, Greg (2007年5月14日). “Back to Basics: An Interview with Wilco”. PopMatters. 2011年9月27日閲覧。 . ^ Cashmere, Paul. “Wilco (interview)”. undercover.com.au. 2007年6月22日時点のオリジナルよりアーカイブ。2011年9月27日閲覧。 . ^ Green, Joshua (1999年3月17日). “Been There”. Salon. http://www.salon.com/ent/music/int/1999/03/17int.html Last accessed July 23, 2007. ^ Pareles, Jon (2004年7月8日). “A Ghost Is Born (review)”. Rolling Stone. オリジナルの2007年6月19日時点によるアーカイブ。. http://web.archive.org/web/20070619094431/http://www.rollingstone.com/artists/wilco/albums/album/6187605/review/6194215/a_ghost_is_born Last accessed July 18, 2007. ^ Hoard, Christian (2005年11月21日). “Kicking Television: Live in Chicago (review)”. Rolling Stone. オリジナルの2007年10月1日時点によるアーカイブ。. 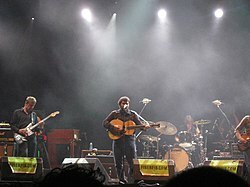 http://web.archive.org/web/20071001224206/http://www.rollingstone.com/artists/wilco/albums/album/8683989/review/8855801/kicking_television_live_in_chicago Last accessed July 18, 2007. ^ Snyder, Jillian. “An Interview with Derek Webb”. Mars' Hill. オリジナルの2007年10月12日時点によるアーカイブ。. http://web.archive.org/web/20071012214033/http://www.marshillonline.com/an-interview-with-derek-webb Last accessed July 17, 2007. ^ Gottlieb, Jed (2007年6月21日). “National Anthems Eschew Catchy for Wilco-like Sound”. Boston Herald. オリジナルの2007年9月23日時点によるアーカイブ。. http://web.archive.org/web/20070923070422/http://theedge.bostonherald.com/musicNews/view.bg?articleid=1007464 Last accessed July 18, 2007. ^ Bruss, Andrew (2006年9月1日). “Grace Potter and the Nocturnals: Bring It on Home”. Glide. http://www.glidemagazine.com/Articles/47840/Grace-Potter-and-the-Nocturnals:--Bring-It-On-Home.html Last accessed July 18, 2007. ^ Swift, Jacqui (2007年7月6日). “Something for the Weekend: Cherry Ghost's Ripe for Picking”. The Sun (London). http://www.thesun.co.uk/article/0,,2006140003-2007310077,00.html Last accessed July 17, 2007. Kot, Greg (2004). Wilco: Learning How to Die (1st ed.). New York City, NY: Broadway Books. ISBN 0-7679-1558-5. Levy, Joe (2005). Rolling Stone's 500 Greatest Albums of All Time (1st ed.). New York City, NY: Wenner Books. ISBN 1-9329-5861-4.